DRIVEN FAR OFF COURSE by gales and rough seas as they crossed the Atlantic in the fall of 1620, the Mayflower's 102 passengers made landfall at a spot much farther north than they had planned. They anchored at the tip of Cape Cod in what is now Provincetown, hundreds of miles from the Virginia territory they'd been aiming for — and well beyond the jurisdiction of the Virginia Company of London, which had issued the patent authorizing them to build a settlement. It was a setback, but not enough to weaken the resolve of the ship's Protestant Separatists, who had come to America to create a community true to their religious beliefs and who would stick together no matter what. 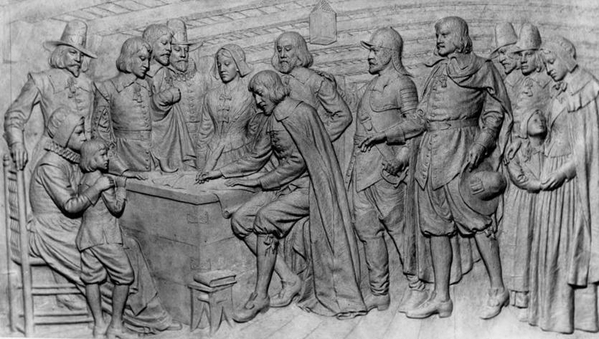 A majority of the Mayflower's passengers, however, were non-Separatist "Strangers," some of whom now insisted they were no longer bound by the original plan. William Bradford, who would become the foremost Pilgrim leader, wrote that several Strangers began to make "discontented and mutinous speeches," announcing that when the ship anchored they would go their own way. The Virginia patent was no longer valid, they said, and "none had power to command them." Something had to be done to keep the group united. That something turned out to be the Mayflower Compact, the foundation stone of American democracy. That may sound like an absurdly grand claim for a document barely 200 words long and improvised in haste. It contained no laws or blueprint for the governance of their new settlement. Some of those who signed were illiterate and made their mark with an 'X'. Many of the signers would be dead within the year. And yet the Mayflower Compact was something new under the sun. More than a jerry-built expedient to keep the group together, it established the first government in the New World based on the voluntary consent of the governed. Every free man on the ship was invited to sign — including those who in England, as mere uneducated laborers, would have had no political rights. Virtually all of them did so, forming what the Compact called "a civill body politick" with the power to elect leaders and make "just and equall lawes, ordinances, acts, constitutions, and offices" for the general good of the colony. To be sure, the signers professed their loyalty to "our dread soveraigne Lord, King James." But they claimed authority to rule themselves not in the king's name, but from their own free will. The agreement they signed off Provincetown Harbor declared their intention to "covenant and combine our selves togeather" for the purpose of self-government. When each man "promise[d] all due submission and obedience," it was to the colony they were poised to launch in America, not to the throne back in London. 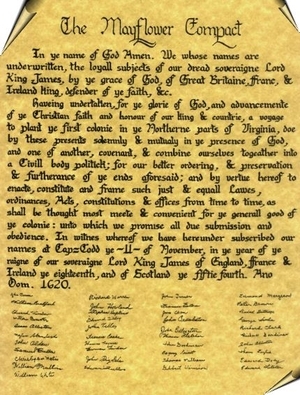 In just 200 words, the Mayflower Compact foreshadowed the themes that would be enshrined in the Declaration of Independence many decades later: that all men are created equal, that they are endowed by their creator with basic rights, that government derives legitimacy from the consent of the governed. More than 180 years later, future president John Quincy Adams regarded what the Pilgrims had done with awe. Their shipboard agreement, he said in 1802, "is, perhaps, the only instance in human history of that positive, original social compact which speculative philosophers have imagined as the only legitimate source of government." What Locke and Rousseau would theorize about, the men on the Mayflower actually did: "Here was a unanimous and personal assent, by all the individuals of the community, to the association by which they became a nation." They did something else, too. They underscored that the right of free people to govern themselves came from God, who is mentioned four times in the brief document. The Compact's opening words are "In the name of God, Amen." Its core purpose, the forming of a body politic, is expressly undertaken "solemnly and mutually in the presence of God." Yet while the Mayflower Compact was explicitly religious, it was not sectarian. It said nothing about a church. It was signed by no clergyman. It contained no Separatist language. There was nothing in it that a mainstream member of the Church of England, or even a Roman Catholic, could object to. Thus, in just 200 words, were sown the great themes of American democracy: that all men are created equal, that they are endowed by their creator with basic rights, that government derives legitimacy from the consent of the governed. Those themes would be enshrined in a world-changing Declaration of Independence in 1776, but they had their birth a century and a half earlier, as a tiny band of Pilgrims prepared to step ashore into a wintry wilderness in the New World, and start life anew.